In a brave Rolling Stone interview published last month, Against Me! 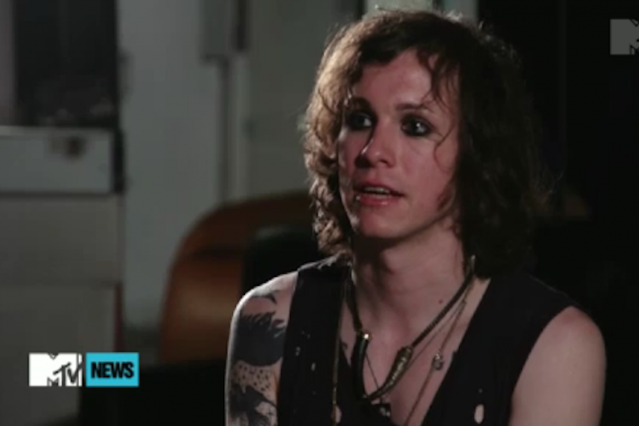 singer-guitarist Laura Jane Grace, formerly Tommy Gabel, came out as transgender and revealed she would begin living as a woman. Since then, the always-badass punk rockers have been opening for the Cult on a U.S. tour that recently found them being joined by Joan Jett for a cover of the Replacements’ “Androgynous.” On June 19, MTV News will post the first on-camera interview with Grace since she came out, including a Q&A with the full band, and SPIN is premiering a few clips online. The video snippets from this latest courageous and revealing interview show Grace looking glam-rock elegant, with dark eye makeup, shoulder-length hair, and dangling earrings, but most importantly, she exudes a sense of confidence and, especially, freedom. Grace tells MTV about how she has long seen herself in Madonna — not only as a musician but also as a woman — and how she gradually discovered she wasn’t going to grow out of this feeling. “Saying to someone, ‘I’m a transsexual,’ is the most empowering thing I’ve ever felt in my whole life,” she explains at one point. In a touching moment, this 31-year-old married rocker thanks wife Heather (“my biggest advocate”) and expresses concern about how other children might treat their two-year-old daughter.